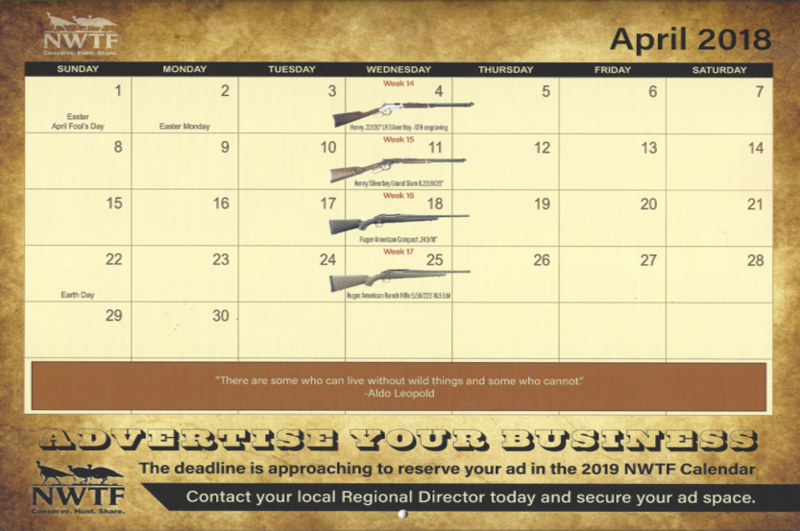 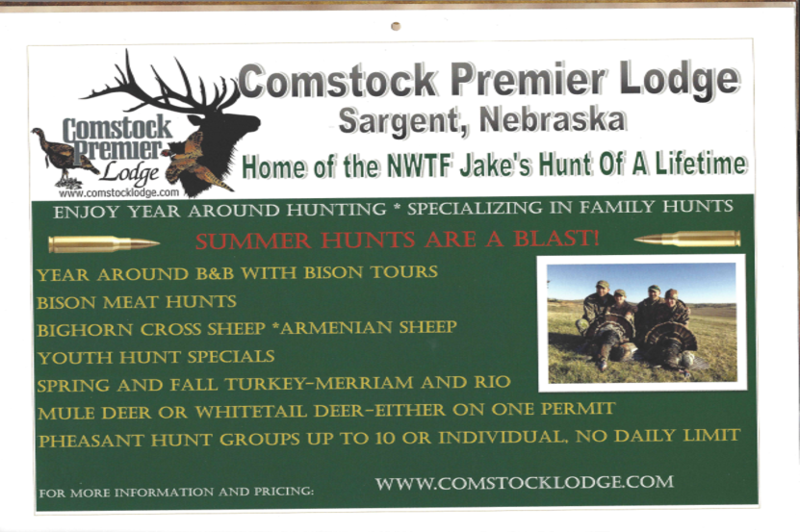 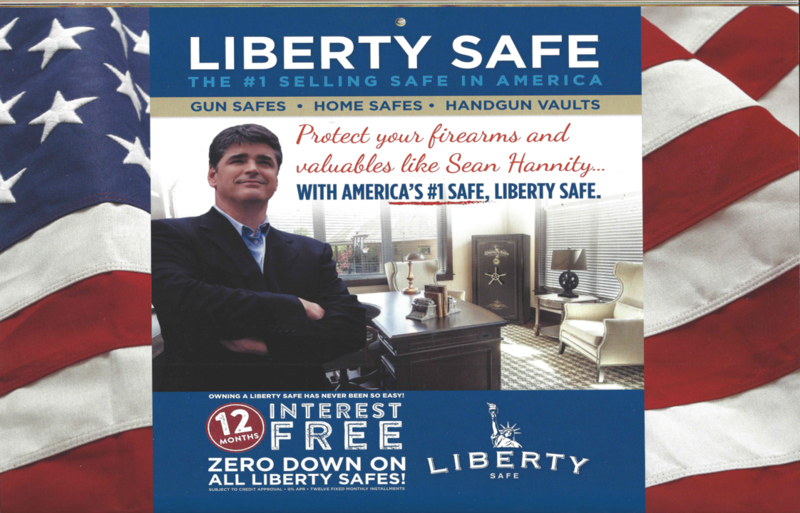 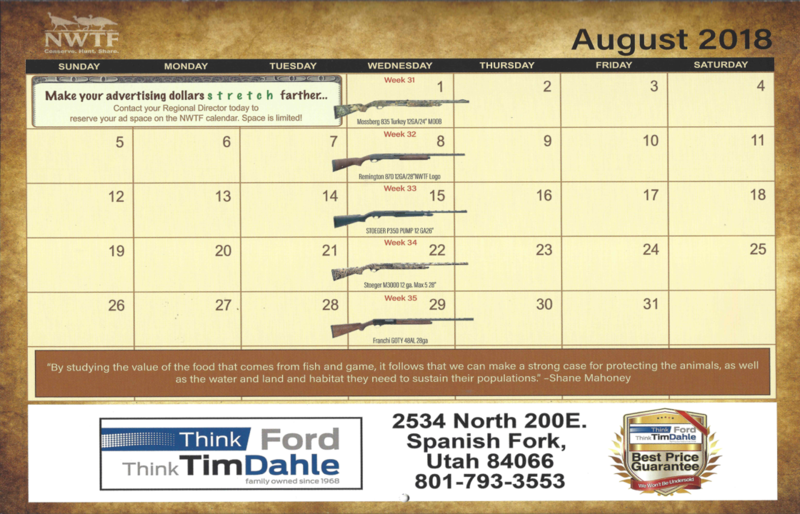 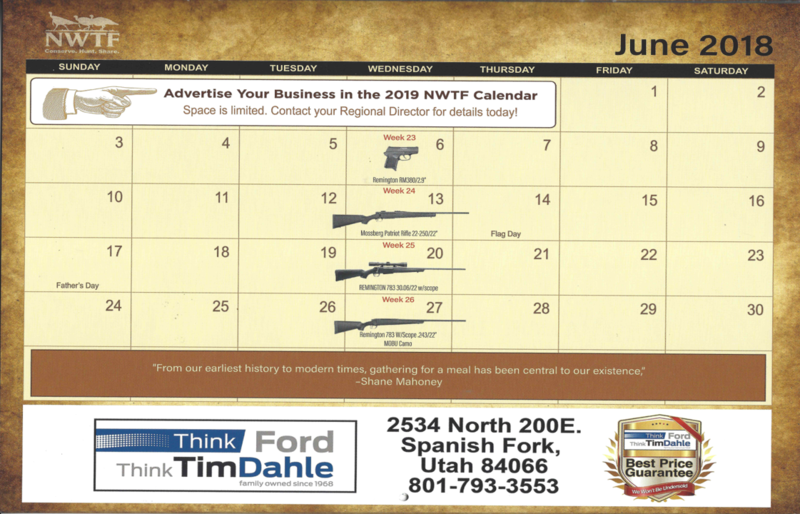 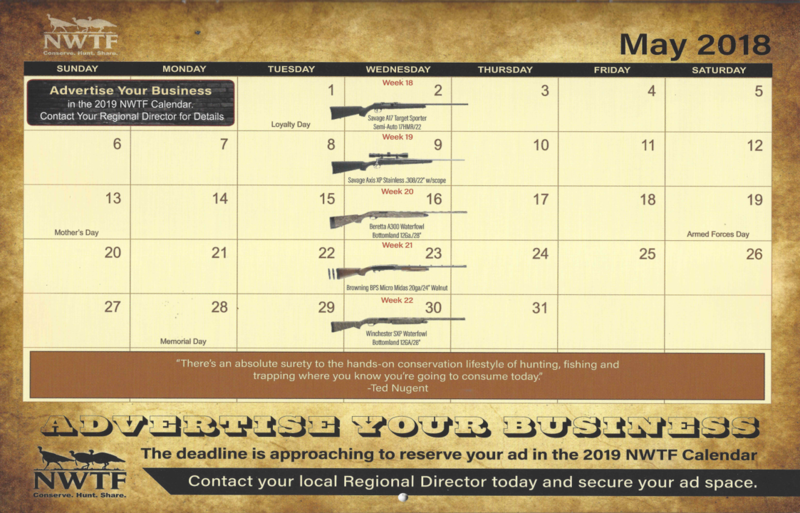 In the past couple of years, Regional Director’s across the country have been successfully selling yearly calendars that are entered into a 52 gun weekly raffle. 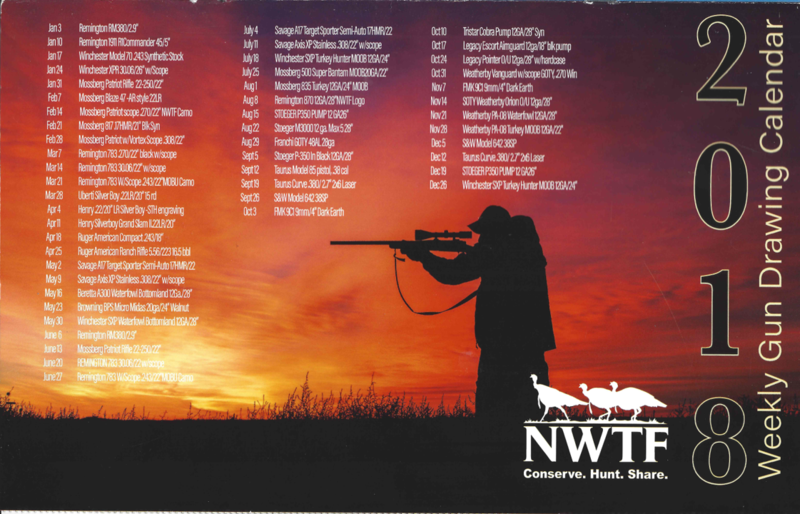 The raffle has made its way West and has reached Arizona! 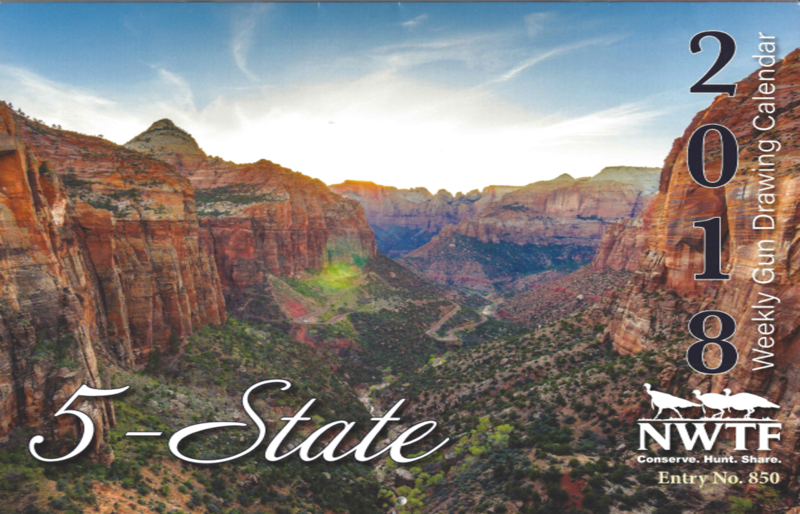 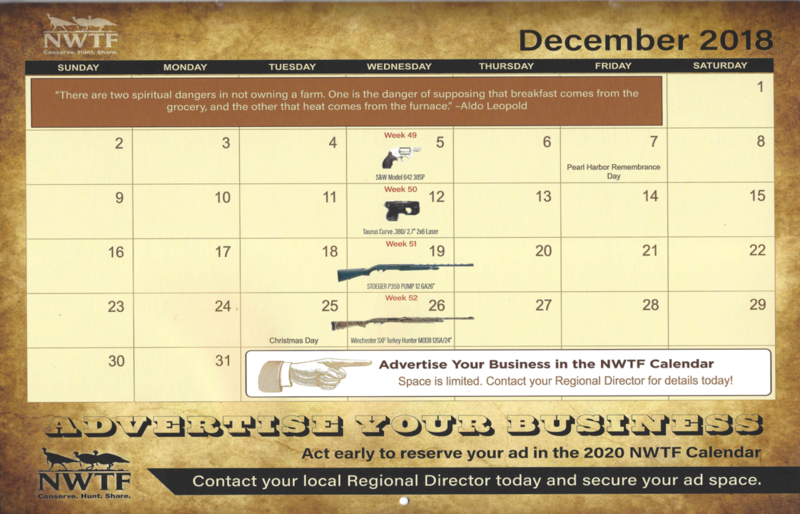 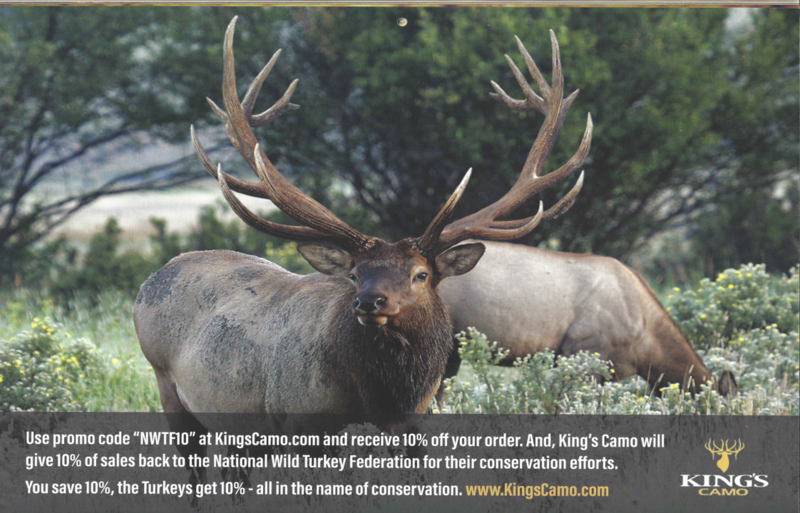 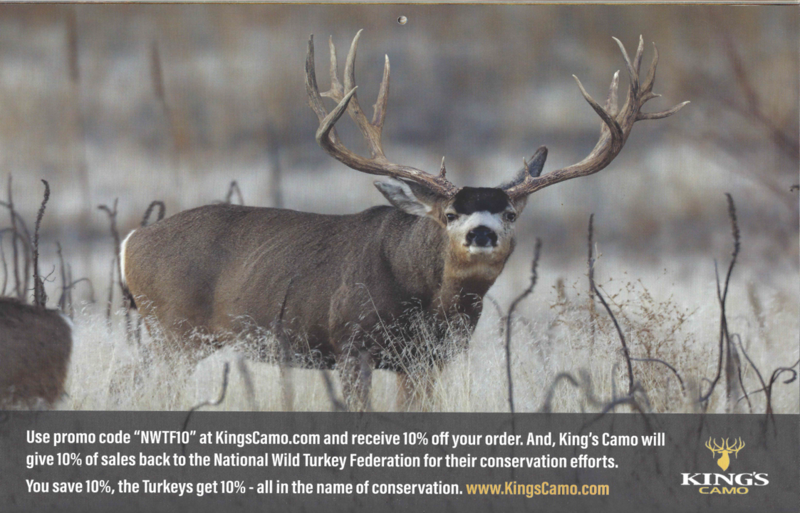 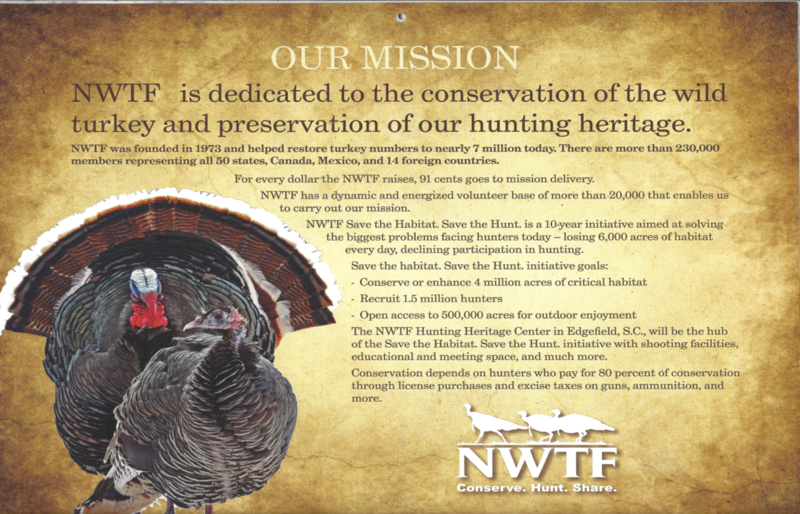 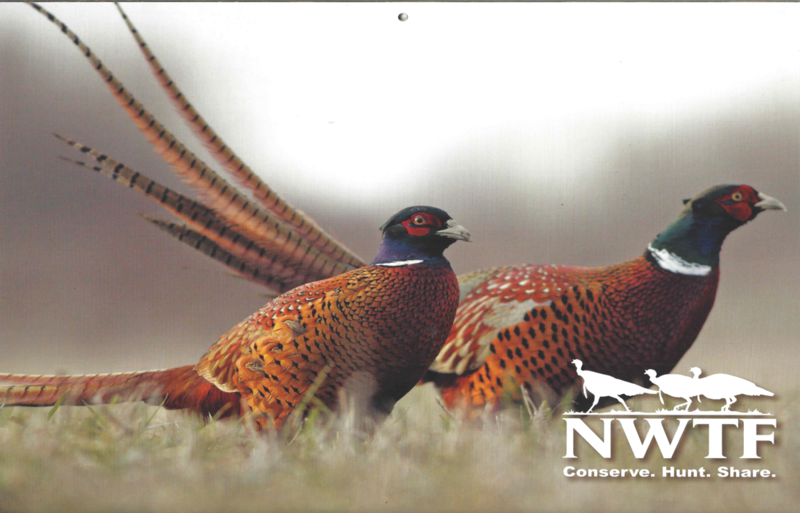 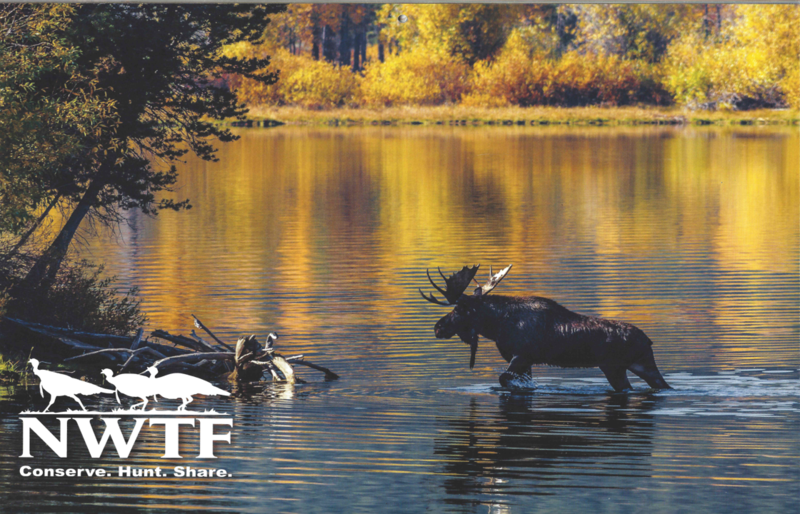 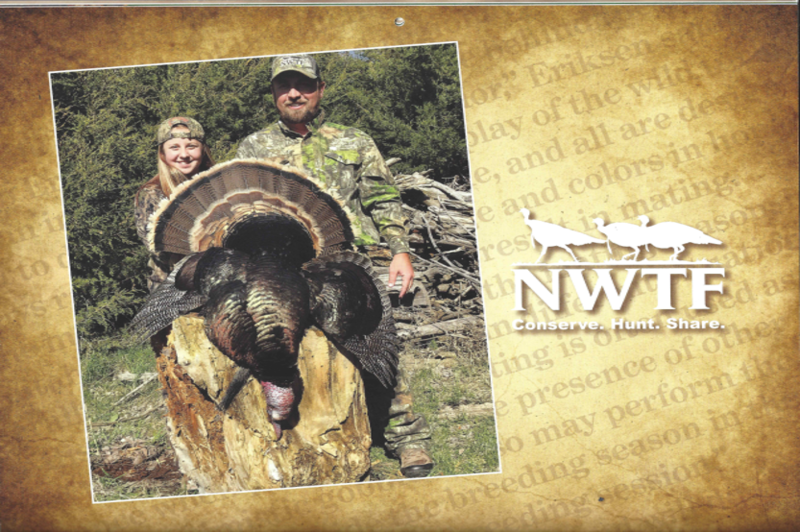 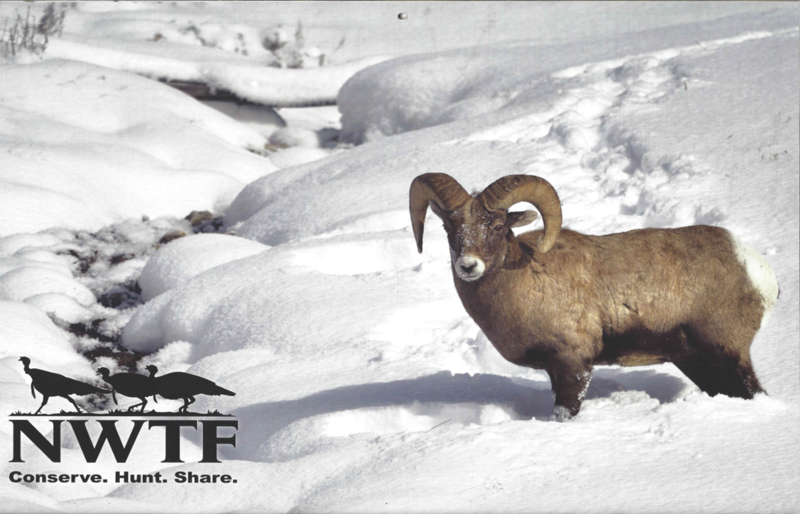 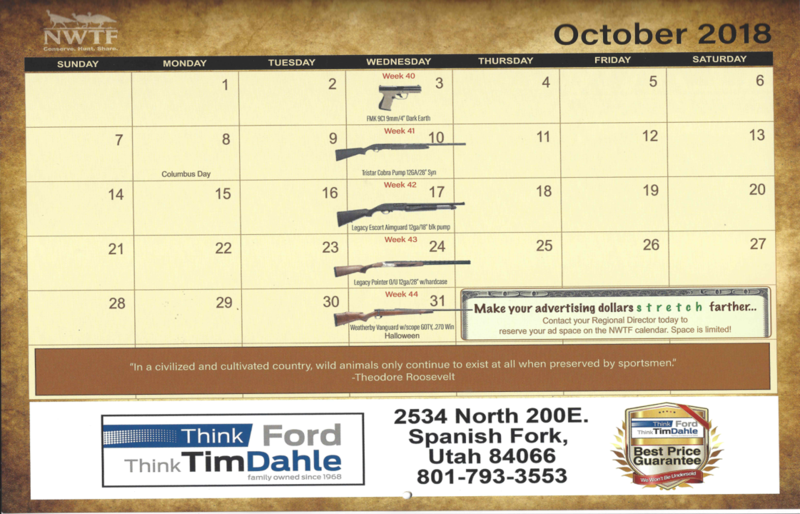 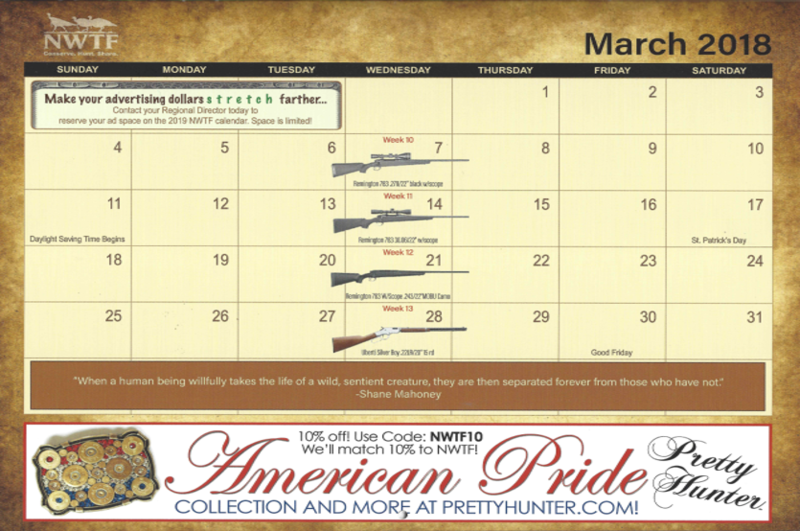 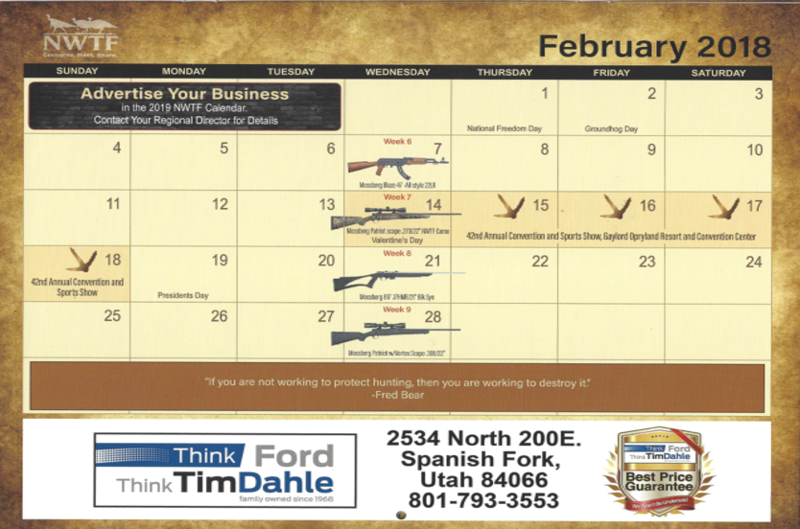 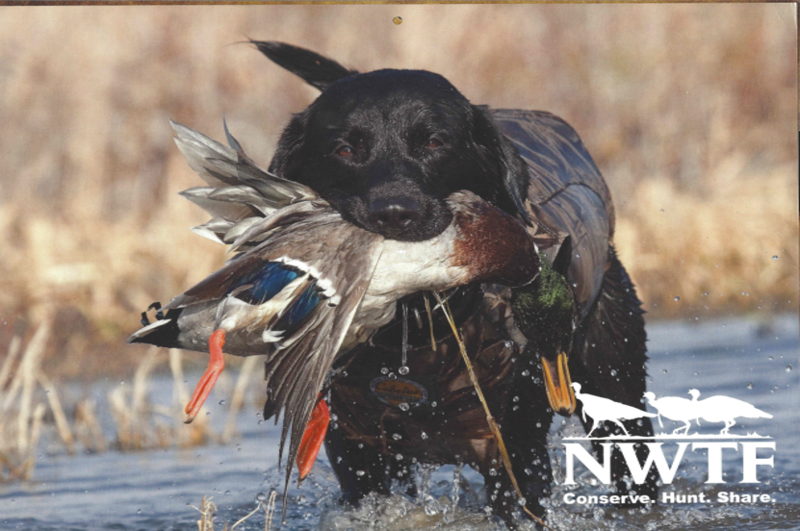 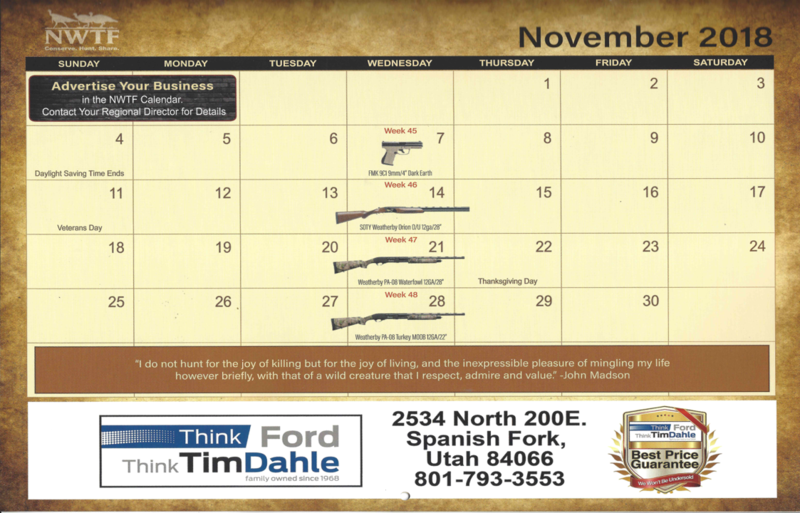 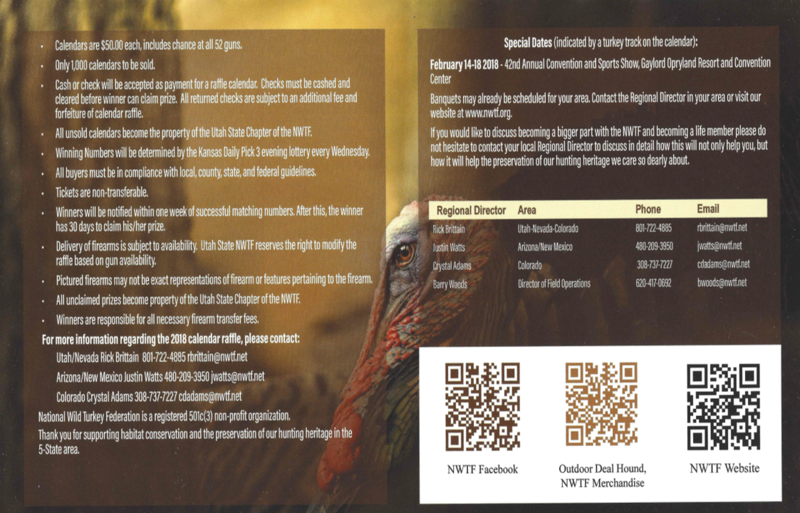 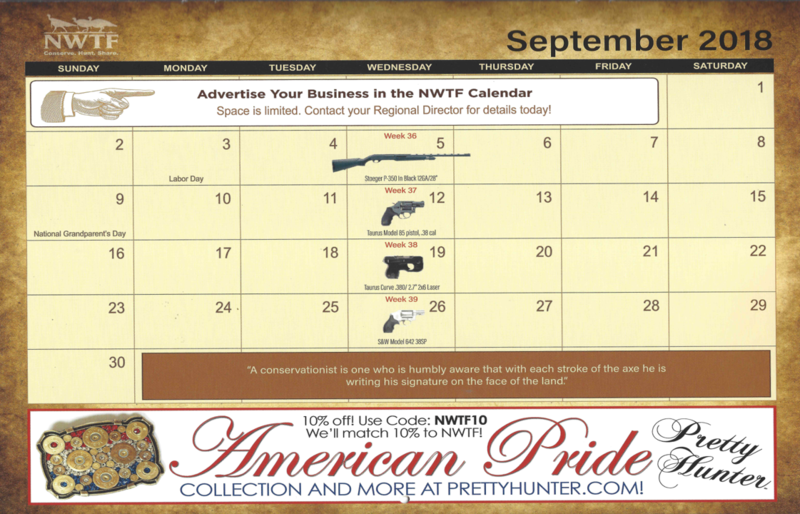 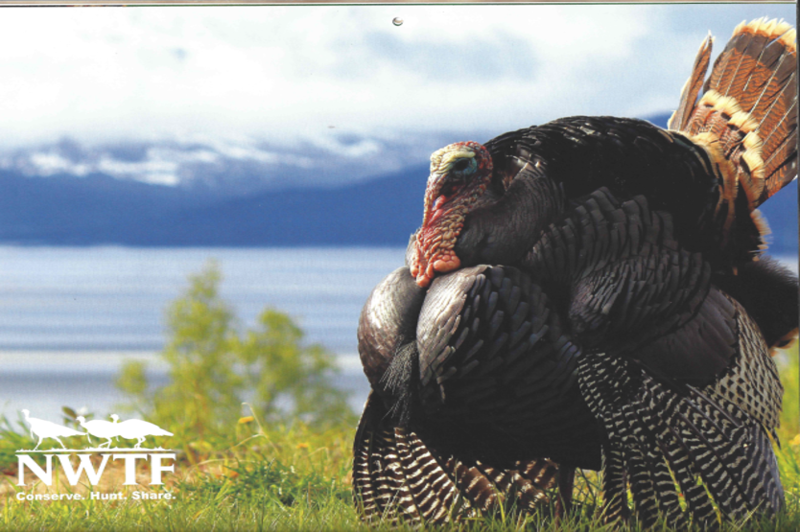 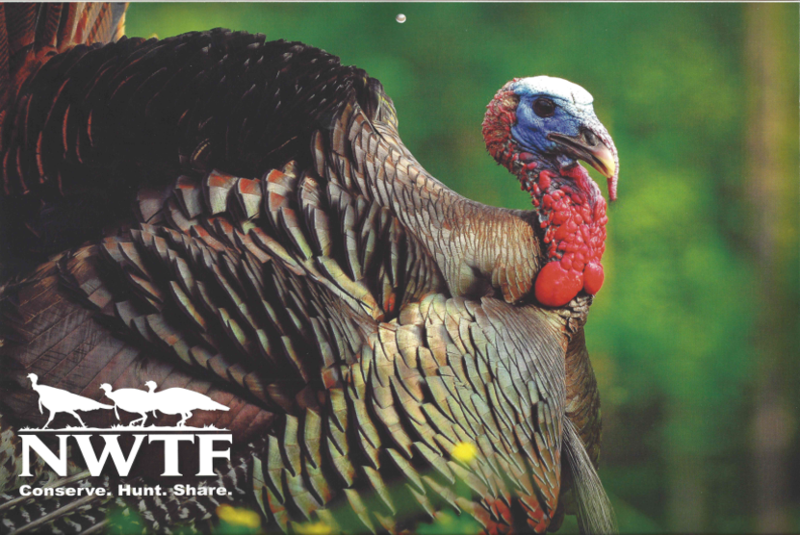 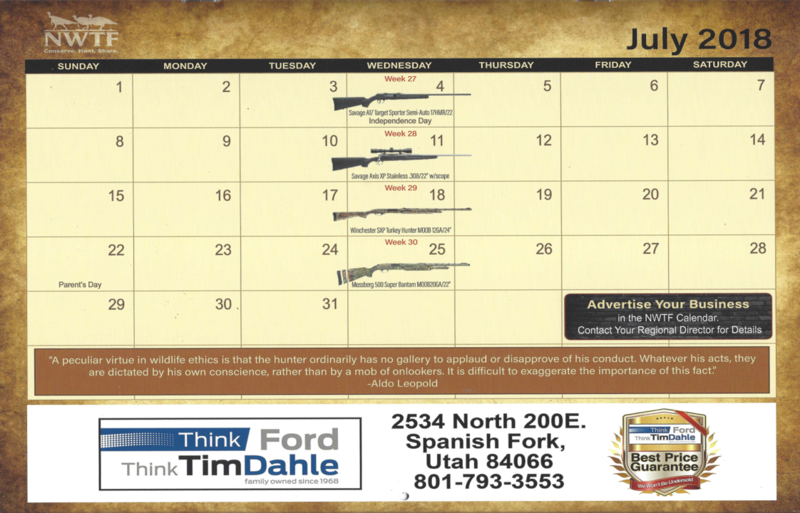 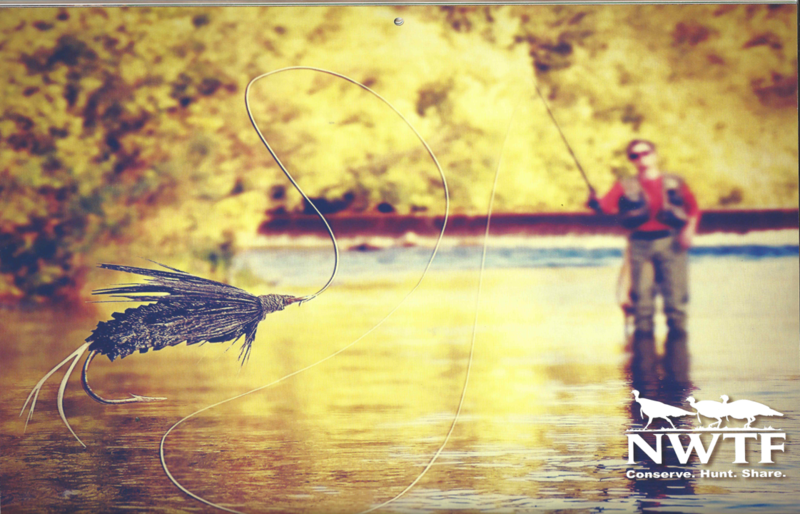 Arizona NWTF will be partnering with Utah, Nevada, Colorado and New Mexico to sell 1000 calendars only! 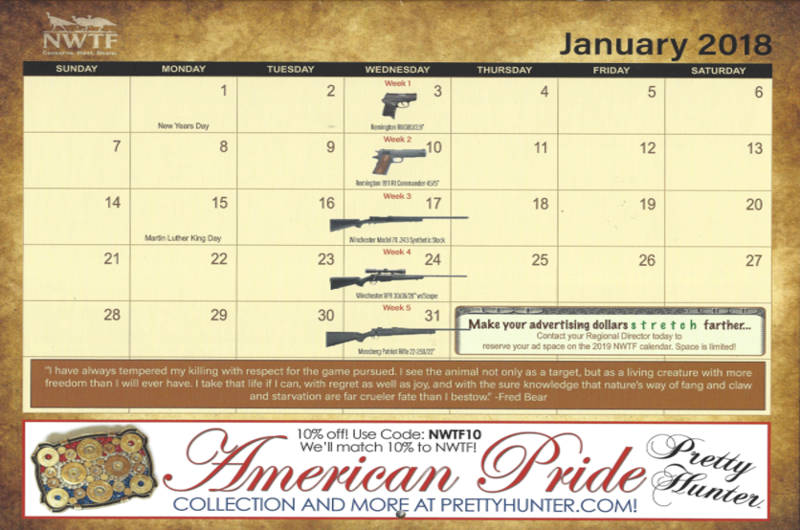 Week 1~Jan 3 - # 604 ~ Las Cruses NM, wins a Remington RM380/2.9"
Week 2~Jan 10 - # 766 ~ Kingman AZ, wins a Remington 1911 R1 Commander 45/5"
Week 5~Jan 31 - # 021 wins a Mossberg Patriot Rifle 22-250/22"
Week 9~Feb 28 - # 611 wins a Mossberg patriot w/Vortex Scope .308/22"
Week 15~Apr 11 - # 412 wins a Henry Silver Boy Grand Slam II .22LR/22"
Week 16~Apr 18 - # 275 wins a Ruger American Compact .243/18"
Week 20~May 16 - # 937 wins a Beretta A300 Waterfowl Bottomland 12GA/28"
Week 22~May 30 - # 913 wins a Winchester SXP Waterfowl Bottomland 12GA/28"
Week 23~Jun 6 - # 770wins a Remington RM380/2.9"
Week 24~Jun 13 - # 047wins a Mossberg Patriot Rifle 22-250/22"
Week 29~Jul 18 - # 913wins a Winchester SXP Turkey Hunter MOOB 12GA/24"
Week 30~Jul 25 - # 699 wins a ​Mossberg 500 Super Bantam MOOB 20Ga/22"
Week 33~Aug 15 - # 637 wins a Stoeger P350 Pump 12GA/26"
Week 34~Aug 22 - # 042wins a Stoger M3000 12GA Max 5 28"
Week 36~Sep 5 - # 028 wins a Stoeger P-350 in Black 12GA/28"
Week 46~Nov 14 - # 748 wins a SOTY Weatherby Orion O/U 12GA/28"
Week 47~Nov 21 - # 998 wins a Weatherby PA-08 Waterfowl 12GA/28"
Week 48~Nov 28 - # 741 wins a ​Weatheby PA-08 Turkey MOOB 12GA/22"
Week 51~Dec 19 - # 189 wins a Stoeger P350 Pump 12GA/26"
Week 52~Dec 26 - # 411 wins a ​​Winchester SXP Turkey Hunter MOOB 12GA/24"